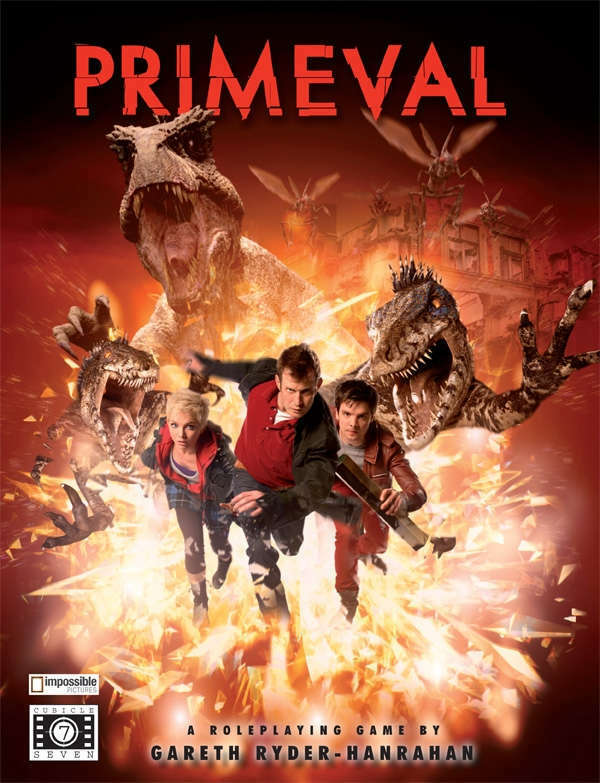 Primeval is a new licensed setting from Cubicle 7 Entertainment that uses the same engine as their Doctor Who line of games. For those unclear about the television show, it centers around a group of people who investigate anomalies, which are rips that permit treacherous travel between points in time. The primary focus for the setting are anomalies that stretch back to prehistoric times, as they are the most common. The rips actually can go to anywhen though, opening up quite a bit of sandbox for a game, which is really what this review is about. The look of the PDF is outstanding, but I offer one caveat: ensure your computer can load heavy graphics quickly. I read the PDF on two different units, a 20+ inch desktop and a 14 inch laptop. The desktop demonstrated how awesome the book looked; the laptop was an exercise in frustration. This isn’t a complaint against the excellent layout of the game, just a head’s up (the laptop is a 2011 model, not an antique). The fonts, layout, and graphics of the book prove excellent throughout. The table of contents is loaded with hyperlinks, taking a GM right to a rule or stat. Stills from the television show make up the “artwork” of the book, which is commonplace for the vast amount of licensed material in the RPG market. – No, and: Not only has your character failed, an additional misfortune compounds the problem. – No, but: You fail, but something mildly advantageous also occurs. – Yes, but: You succeed, but something mildly off-setting occurs. – Yes, and: You rock out and something even better occurs. too rarely in games. Building a terrific character is great stuff, but what if everyone makes the same damn cookie cutter hero? Problems. The rules suggest open character creation with the goal of generating a functioning team. After all, you can’t storm a dungeon with nothing but dwarves. As source material for the show, the book appears to do very well. I felt like I watched the first three seasons of the tv show after reading the book. Being a licensed product, the daunting place for getting gamers involved is having gamers who are fans of the show. By coming to this material knowing next to nothing about the source, I took it as a time travel game along the lines of Tony Lee’s under-appreciated Odyssey Prime. The government is aware that something is wrong with time (dimensional travel in OP) and has the first reaction of hiding it. Who doesn’t want to play something like that? I would come at this material blissfully ignorant of the show and tell my own stories about anachronisms popping up in modern times. It can take players anywhere. Also, why not bring characters from Doctor Who right into this setting? The system is 99% identical. What causes the anomalies: the TARDIS. Every time the Doctor has popped up somewhere it has weakened the very fabric of time and space. For whatever reason, Earth is the unlucky recipient of the majority of these anomalies. While the rules do not talk about jumping dimensions, it does suggest that the future is mutable. This is a campaign of gaming without even knowing the source material. And that is exactly what I want in a licensed RPG and what I think kills the unsuccessful ones. A huge part of the book deals with the differences between various points of prehistoric time. I like the way the author broke down these periods, including such atmospheric changes as air content and vegetation. The glimpse at the possibly future is likewise eerie, but a good read. It also gives hints to what creatures might come through each era, giving a way of “showing not telling” players what was coming their way. If they happen upon a certain creature mucking around the local woods, they have the tools to deduce its identity and home time period built right into the rules. The rules do suggest using a little bit of fictional license with real-world creations, making a leaf eater a meat eater, for example. By the way, cute joke with the Diana Jones character name for the example character in the book. I had to double-check that it wasn’t a character’s name from the show or that there wasn’t a reference to the Ennies.